Visitors at the Farnborough International Airshow 2018 this Summer will witness another key milestone in the history of Farnborough airfield with the opening of the major new Exhibition and Conference facilities. These state-of-the art spaces are now nearing completion. So what better time for us to provide you with a similarly inspired and powerful marketing package for this year’s show? We have supported clients for over 2 decades of FIAs and with our PR, hospitality and stand build partners we can create and deliver campaign activation before, during and after the show. Design Inc will ensure your message is heard, your prospects are engaged and the full potential of the event is fulfilled for your business. How can we help your plans take flight? 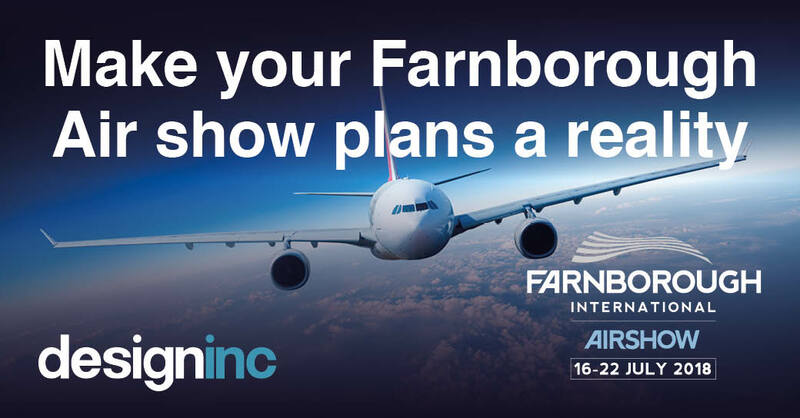 Our Farnborough Air Show 2018 marketing services include: Planning and activation, Public and media relations, Advertising, Digital marketing, Stand design and build, Video and AV production, Hospitality and events, Visitor management, Content creation, CRM and data, Corporate gifts and Promotional items.